When it comes to slicing and dicing, a good sharp knife makes all the difference. But sharpness is just one of the many attributes that makes R. Murphy Knives a cut above. Since 1850, R. Murphy Knives have had a special place in the kitchens of cooks with discerning taste. The company is located in Ayer, Massachusetts where each knife is produced using a handcrafted manufacturing process for unparalleled quality and a more consistent edge. 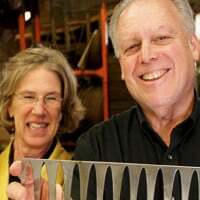 All R. Murphy Knives are precision ground, hand edged, and honed of carbon steel, which retains its edge longer and re-sharpens in a few swipes. Contoured handles are made of woods like Honduran Rosewood, known for beauty and strength. For added durability, each handle is infused with a wood stabilizer before being hand polished to a high luster. 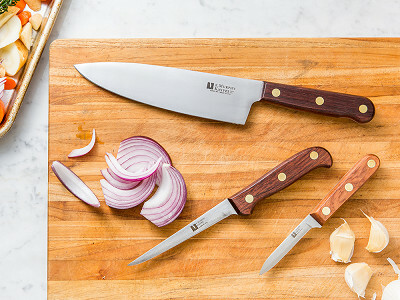 If you’re looking for an edge in the kitchen, R. Murphy’s Knives are sure to satisfy. When it comes to slicing and dicing, a good sharp knife makes all the difference. But sharpness is just one of the many attributes that makes R. Murphy Knives a cut above. 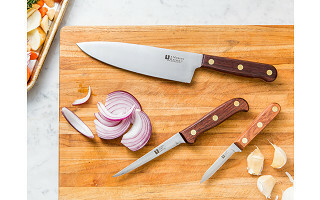 Since 1850, R. Murphy Knives have had a special place in the kitchens of cooks with discerning taste. The company is located in Ayer, Massachusetts where each knife is produced using a handcrafted manufacturing process for unparalleled quality and a more consistent edge. All R. Murphy Knives are precision ground, hand edged, and honed of carbon steel, which retains its edge longer and re-sharpens in a few swipes. Contoured handles are made of woods like Honduran Rosewood, known for beauty and strength. For added durability, each handle is infused with a wood stabilizer before being hand polished to a high luster.